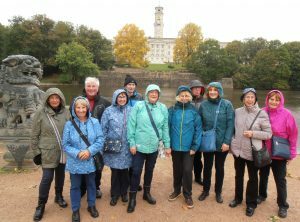 The group was set up for members to be taken on organised walks in and around the city centre of Nottingham. 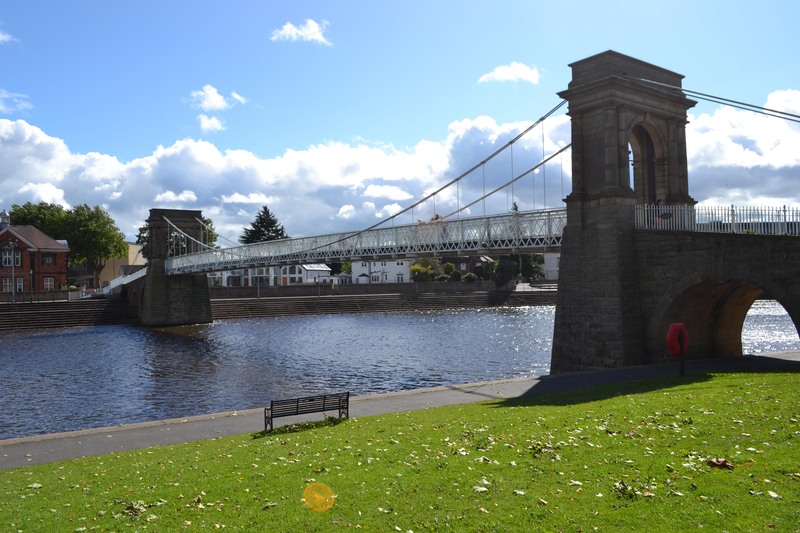 We visit places of great interest and learn about the city’s history; searching in areas where normally you would never go, showing you wonderful buildings and architecture. Also the now famous cave system linking up with the city castle. We also talk about famous local people on our travels. 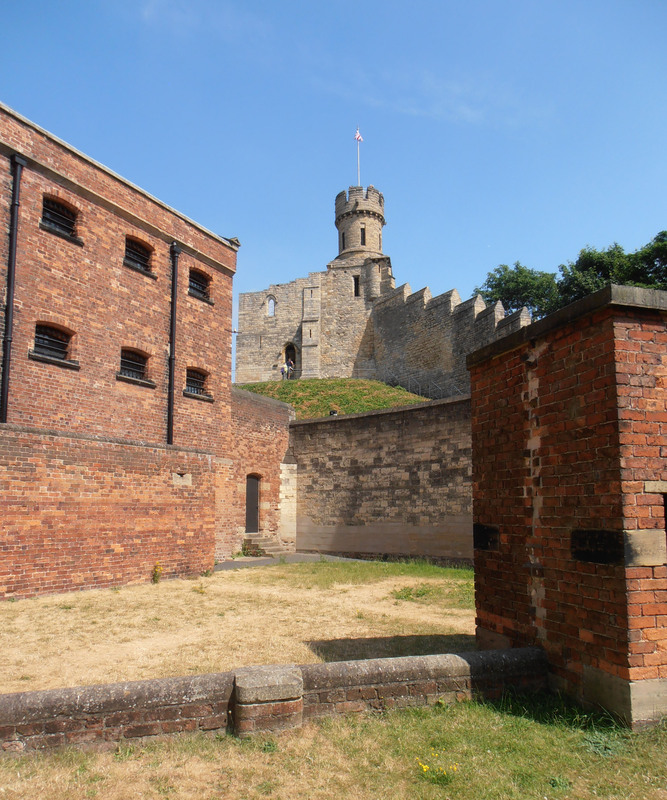 Nottingham has changed so much in the last fifty years, so we have plenty of different topics to tell you about. 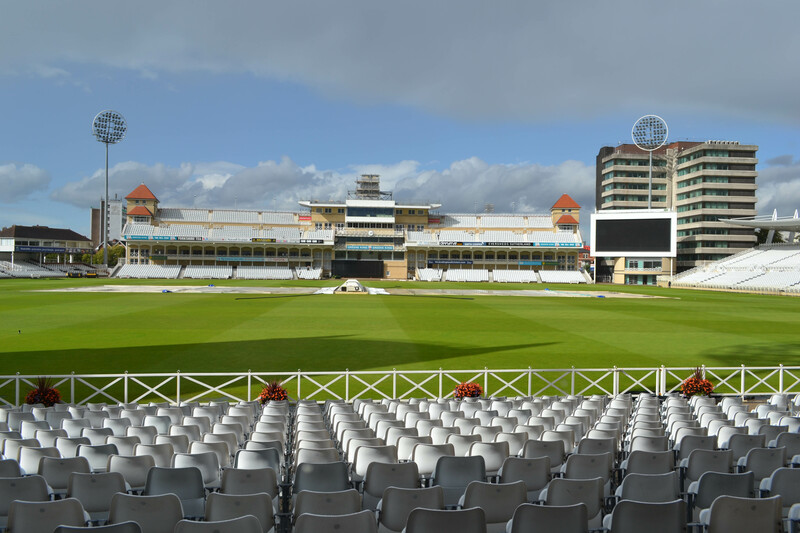 Most members who join us enjoy free travel to the venues on buses or the tram. If this information ticks the box for you, consider joining us on walks. You will be made most welcome. 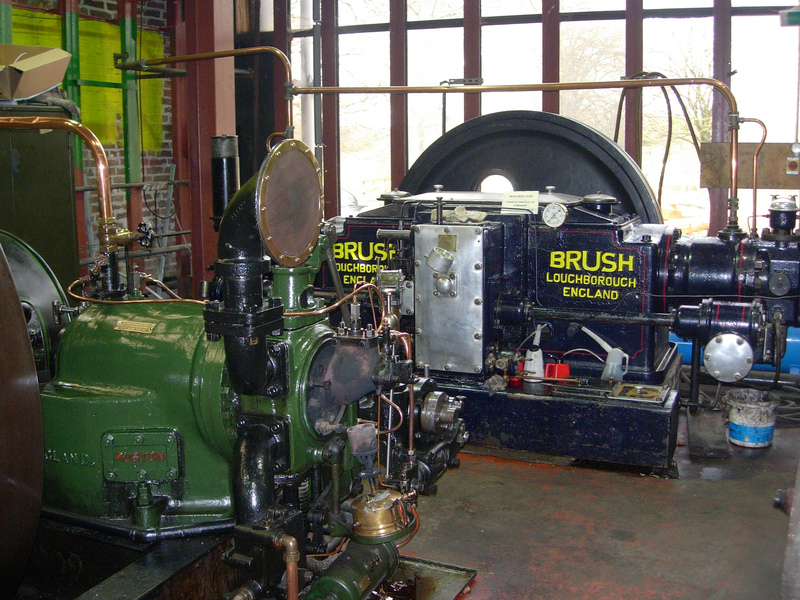 Wednesday 29th May – Monthly tour of Papplewick Pumping Station. 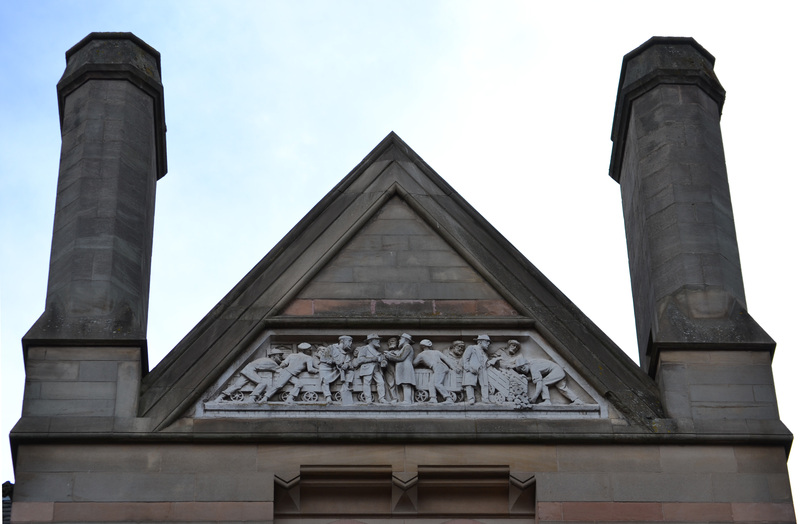 Meet 11.00am on the site for a guided tour of one and Half hours, cost £4.oo. June tour to be arranged. Any queries please ring me Len Marsh. 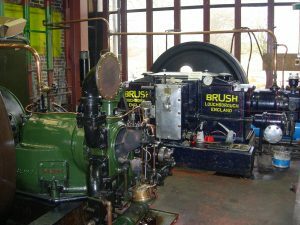 April visit to the Nottingham Industrial Museum. 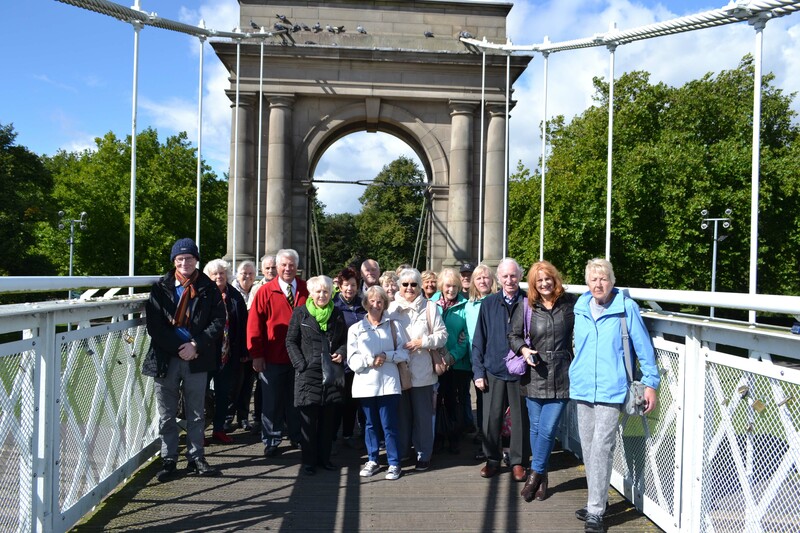 A nice fresh sunny Saturday on the 13th April welcomed our City Treasures Group when we met up in the car park at Wollaton Hall and at 11.00 am. 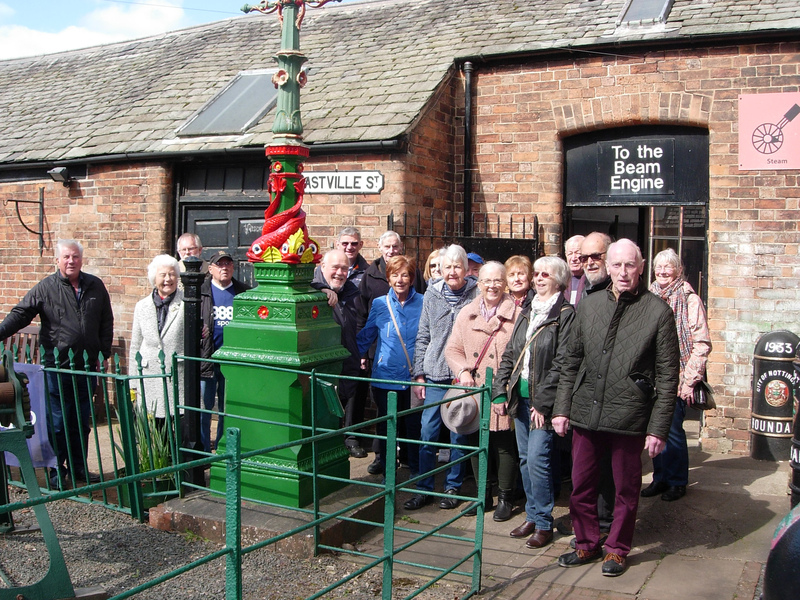 We all stepped into the Nottingham Industrial Museum for tours of the heritage centre to explore five fascinating galleries. Here talks were given by volunteers and also live demonstrations of lace machinery, pumps, generators, model railways etc. 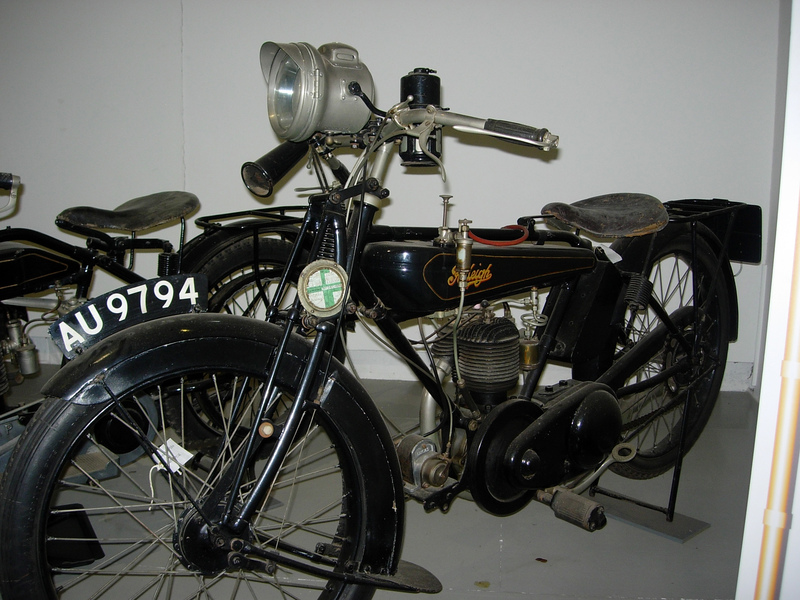 We were all amazed at how good the collection of industrial equipment was, also to mention a few famous names, Humber and Raleigh cycles, Brough motor bikes, not forgetting the John Player cigarette vending machine and a beautiful framed picture all done in local lace. Well in my opinion this venue deserves a visit from everyone interested in the city’s history, it tells the story well and the exhibits are brilliant. Len Marsh. 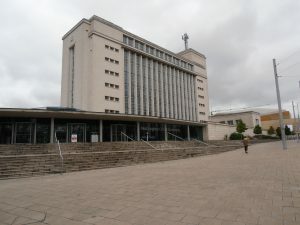 March visit to City Archives Centre. 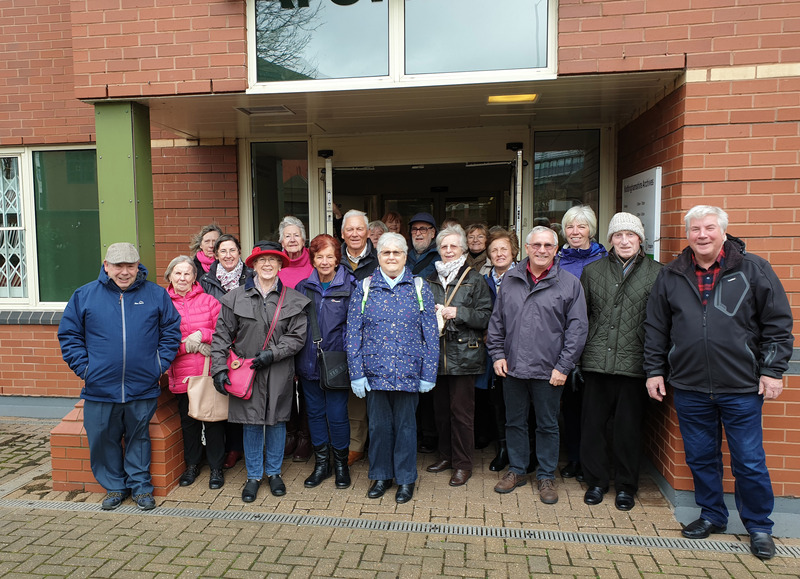 On Wednesday 9th January 2019 twenty-four members met up in the arcade where I gave a short talk on our latest subject which was the City Law Courts, a walk followed firstly to the Nottingham Crown Court. A building you would probably describe as having no architectural features but inside some lovely old framed photographs of Nottingham streets and people, also Goose Fair in the square, the Victoria Railway Station and Nottingham Lace factories, for which we are famous. After viewing these we split into two groups and entered courts number 2 and 3 to gain the feeling of the British Judicial system. This turned out to be a very interesting experience for all concerned. We then had an informal talk and questionnaire with the resident judge. We were treated very politely and made welcome by all the court officials. Leaving this building we proceeded to make our way to the Nottingham Magistrates Court, a much larger complex which sits on the site of the Nottingham Carrington Street Railway Station, the stone gateposts still frame the pathway to it. 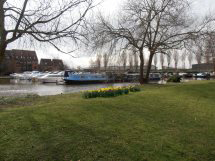 The canal also divides the frontage which makes for a picturesque setting which is quite modern but pleasant to look at. 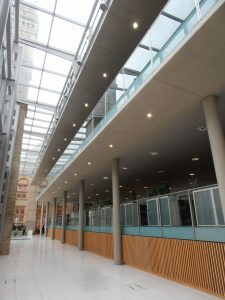 Inside it has a circular hall with four floor levels divided by central lifts leading to 18 courtrooms. 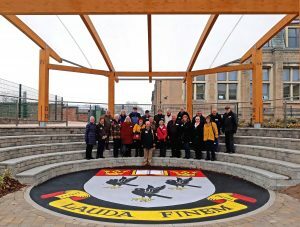 We all sat in court no 2 once again for experience, then when we came out, we viewed the internal superstructure design which we found interesting. We took refreshments in the internal café run by Tree Tops. Outside again we observed the Bridewell Police Station and the Youth and Family block also part of the complex, the car park area at the back used to be the Midland Railway goods shed dated 1874. 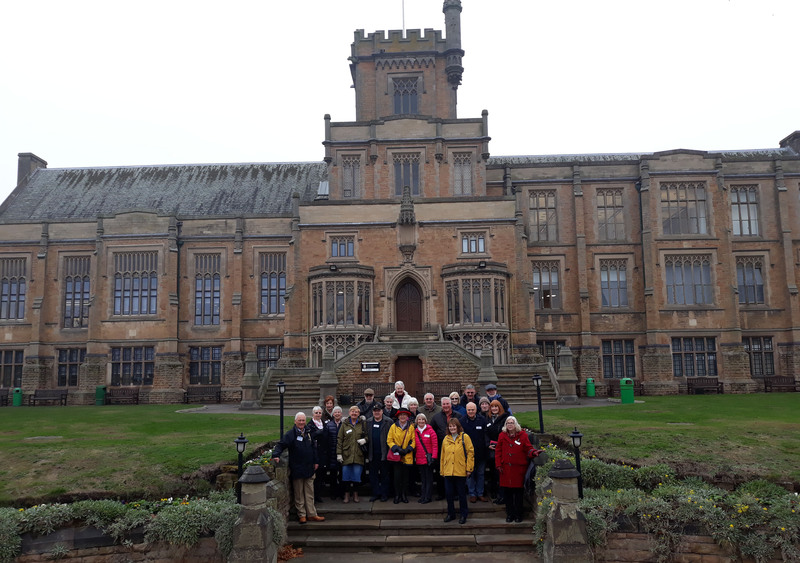 On Friday 23rd November 2018 twenty two of our group members met at The Nottingham High School on Waverly Street. We met Kamala, the development officer, who took us to a seated hall here we met one of the ex head teachers. He gave us an interesting lecture on the history of the High School covering five hundred years, illustrated with photos of the original school and the present one with its new additional buildings, which are very impressive. 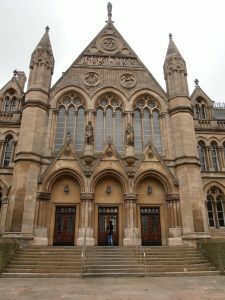 We then had a walk covering the reception frontage, the War Memorial, the John Player Music Hall, the Quadrangle and other buildings were pointed out to us. Then we walked through the main dining area to the latest Junior School where we posed for a photo. 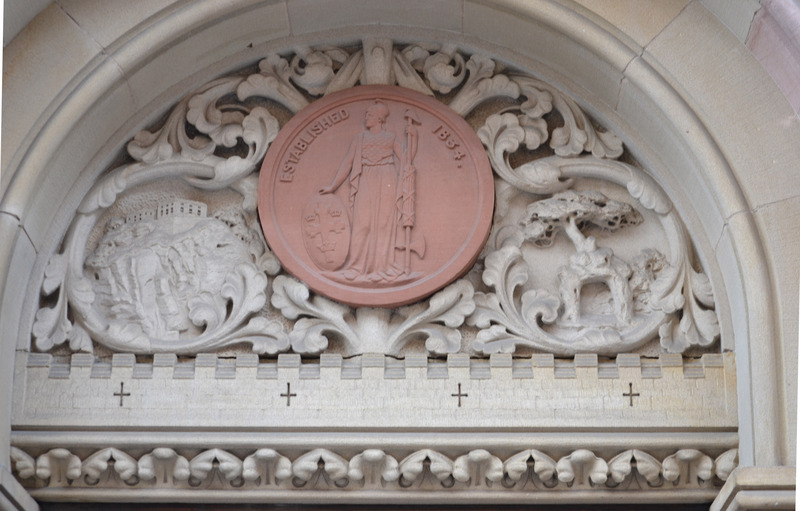 We are fortunate to have such a marvellous school as this in our city providing a high standard of education and over the years some very influential people have studied here. 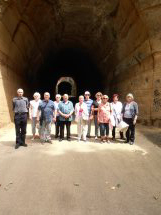 We enjoyed the trip and I have had some good feed back from members, which justify it as another city treasure. Regards Len Marsh. 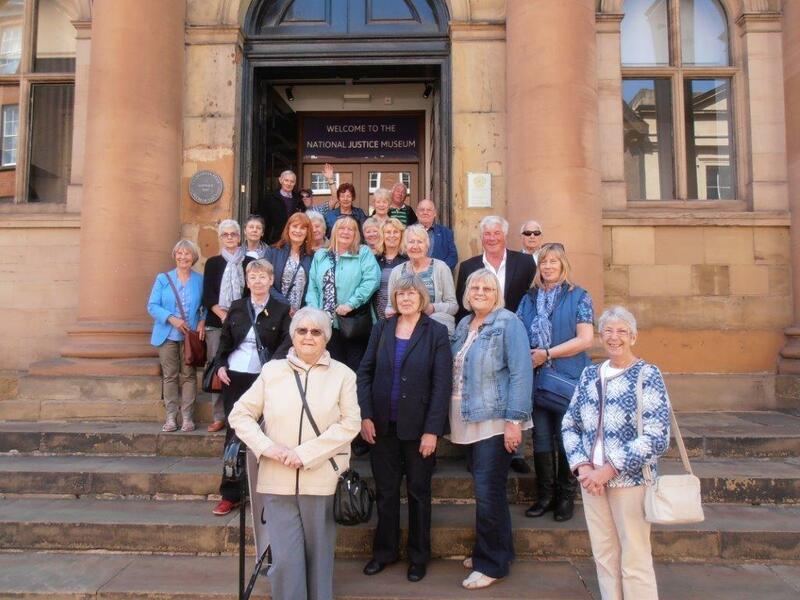 A group of fourteen members met in the Council House Arcade at 11.00 am Friday on 12th October 2018. We then took a tram to Highfields where we alighted and made our way to the Lakeside pavilion. From here we started our circular walk of the lake. It was a wet and windy day but undeterred we continued, observing Herons, Coots, Moorhens and various other birds. 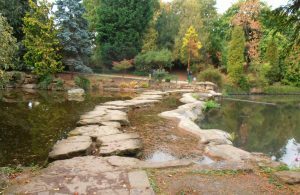 At the halfway point we crossed the famous stepping stones to move on down the lovely avenue of different species of trees to the principle entrance to the park. Here the iron railings and pillars have been replaced to the original designs. I gave a short talk at the croquet club. 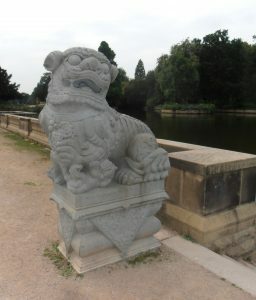 Then we moved onto the lakeside for a group photo and a browse over the new Chinese lions at the waterside. We continued around the lakeside until we arrived back at the pavilion café were we all took refreshments, after which I took the group to the recital hall for a lunchtime concert. This featured a selection of jazz standards and original compositions by teachers and lecturers from the university, a really first class group of musicians. This brought our day to an end but everyone had enjoyed the trip. 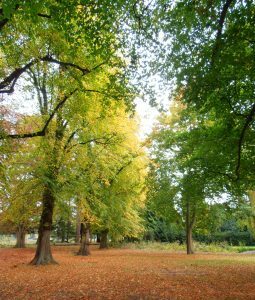 Thanks to Sir Jesse Boot who paid for this park to be set up, and recently the National Lottery Funded project for the park restoration in 2017-18 of £4.8 million pounds. Well worth a visit. Len Marsh. September visit – Nottingham City walks 5 + 10. August visit – Nottingham the Watson Fothergill buildings. 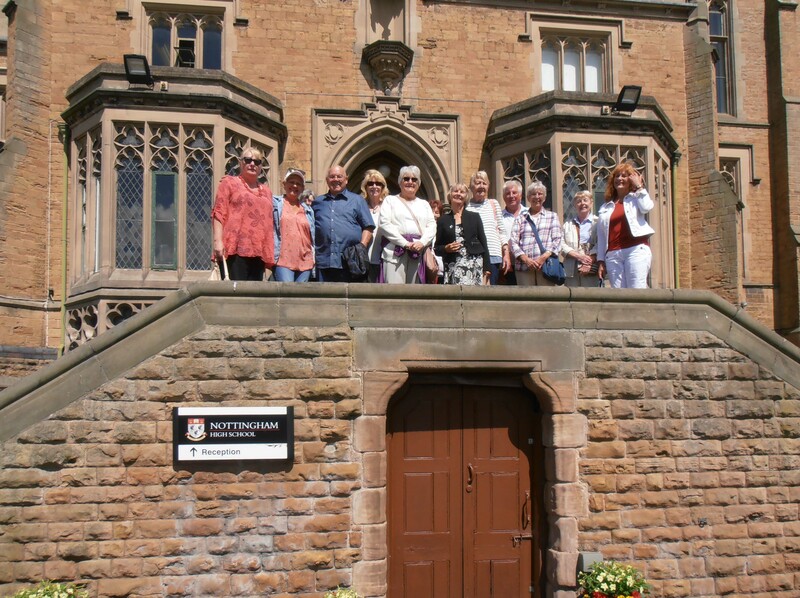 A group of twenty one members of City Treasures met in the Council House Arcade on Wednesday 8th August 2018 to carry out the Walk 7 -Watson Fothergill trail, researched and compiled by Margaret Naylor, Pat Collins, Denise Watts, and Diana Pidgeon of the Discovering Nottingham Group to whom we are grateful for the information in the book. 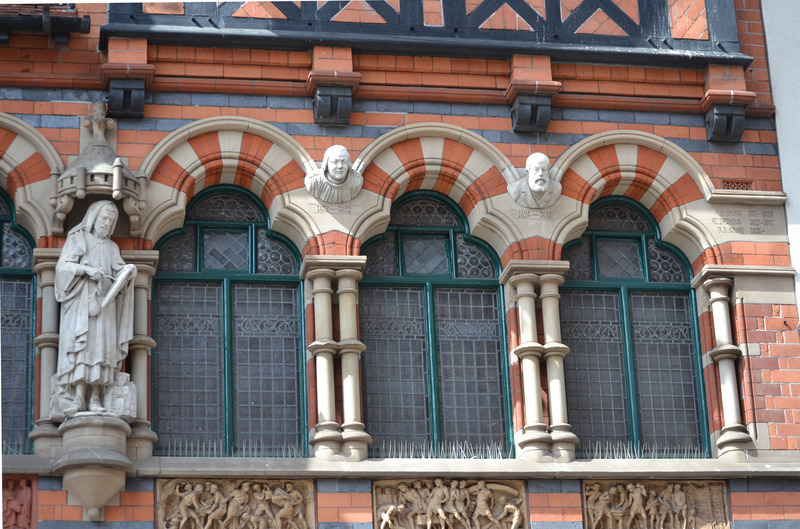 Watson Fothergill was without doubt an architectural giant as we can all see in our city. After giving a talk on his life and achievements we touched on the sadness of the demise of the Black Boy Hotel. Then we paid homage to the little green plaque on the wall of Primark, most of us were unaware of its existence, also it is hard to believe how the city could demolish one of Watson Fothergill’s masterpieces and replace it with an uncharacteristic concrete block. We studied four buildings then had a refreshment break before continuing onto four more. As it states in the book his designs were to make you look up and this we did much to our own pleasure, once again we have seen some wonderful city treasures and I feel fortunate that I have shared this great architects achievements with my group. Len Marsh Walk Organiser. A group of members met at Nottingham Midland Station on Wednesday 11th July 2018 and took the train to the City of Lincoln Station, from here I took them by bus to the Lincoln Hotel. After a short walk to the Information centre we purchased tickets for a tour of the cathedral and castle, but first a cup of tea in a quaint teashop, then onto the cathedral. Well it is one of the biggest examples of gothic architecture in this country and I must say when you first confront the building its very inspiring, I never imagined it being so big and absolutely beautiful both internally and externally. 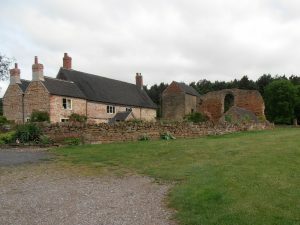 Next we moved onto the castle and the first thing that draws your attention is the massive medieval wall surrounding it. Within the grounds are Lincoln Crown Court and also the Victorian prison which we visited containing a vault housing the Magna Carta. Then we joined a guided tour around the grounds for a very good history lesson on the castle, our thanks to Barney for that. 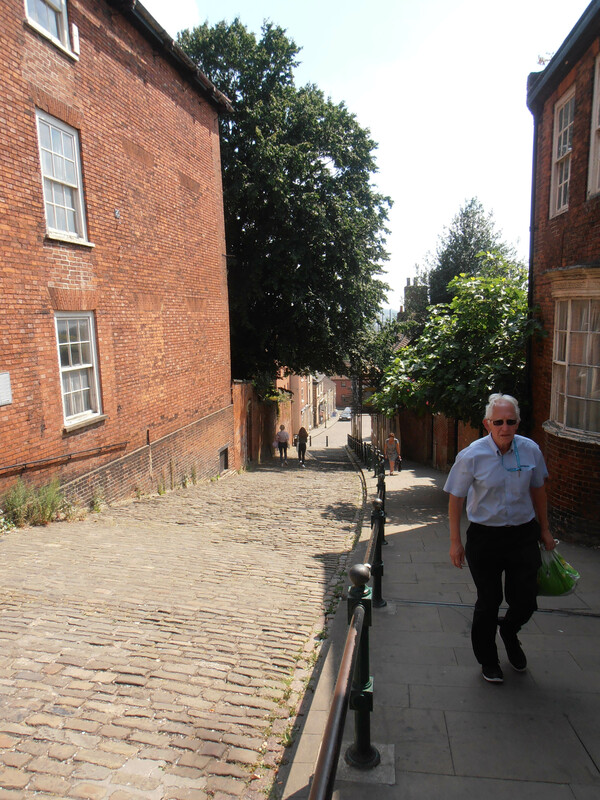 Next we walked down the appropriately named Steep Hill and enjoyed the little antique shops. 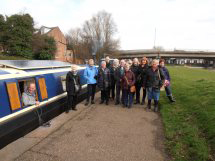 We continued down to the High Street and then branched off to Brayford Pool where we all took refreshments. Afterwards we made our way back to the station for our return journey. 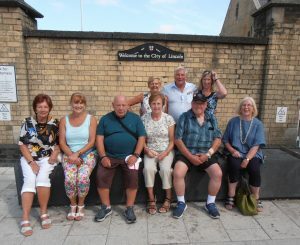 My summary was this is a very historical city with plenty to see and offer, we must return to see some more of it again, an interesting day had by all of the group. Len Marsh. A group of eighteen members met in the Nottingham Council House Arcade for our tour of Nottingham University Park. We took the tram to Highfields where we alighted and walked to the Lakeside Arts Centre. From here we commenced our tour moving on into the park and grounds and a brief look into the Keighton Auditorium to observe the modern lecture hall then onto Cripps Hall and the foundation stone laid by the family in 1957 for the students accommodation. Moving on we walked down a lovely Copper Beech tree lined avenue where we saw a new modern style Cripps student health centre being built. Further on we came to the historic Lenton Hurst house built for William Player, the younger son of tobacco magnate John Player. It has a lovely sunken garden backdrop designed by Gertrude Jekyll in 1911. Further on we came to The Downs, a grassy wildflower meadow surrounded at its edges by a wonderful variety of species of native and other trees from around the world. We stopped here to admire the view and I also gave a talk relating to the university’s history and also naming famous people who have given lectures here like Albert Einstein, Mahatma Gandhi, H. G. Wells, and our local man D. H. Lawrence. 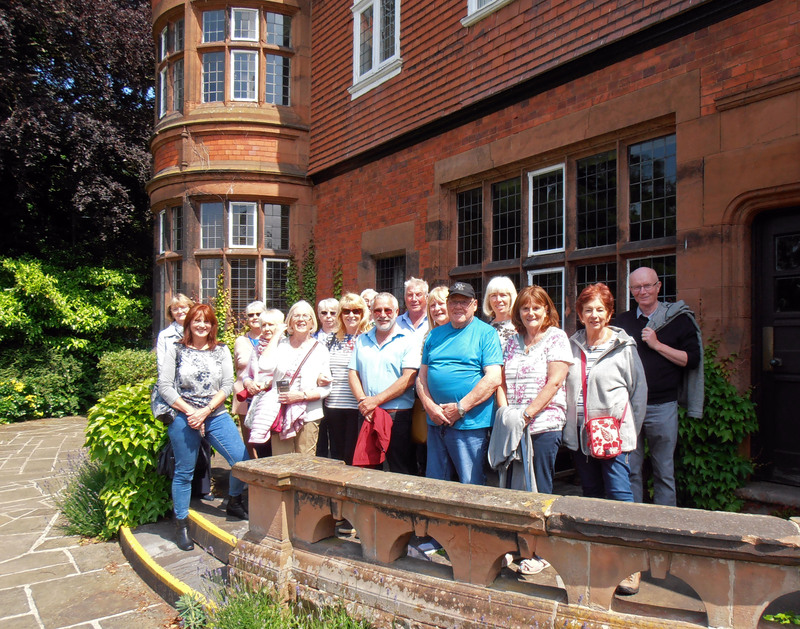 Next we looked at the oldest building on the park, Lenton Hall, now part of Hugh Stewart Hall. William Stretton designed this house in a pseudo gothic style embellished with battlements and turrets, also on the west side there are dummy windows made to avoid tax in that time period. At the back the lawn drops away to a circular garden surrounded by a flowered rockery and a colourful red Acer tree. We followed a narrow footpath to enter the main library with not so many books but screens and electronic technology to help with research, how times have changed! Then we moved onto The Millennium Garden, a proper showpiece with many eye-catching designs. My favourite is a stone sculpture called Flayed Stone, hand carved from a single piece of glacial granite. Further on we saw Highfields House and went into the walled garden. 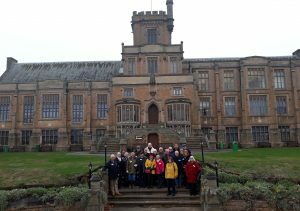 After viewing the new terraced garden with the ground level fountains we went on to the Trent Building to look at the clock tower and masonry. 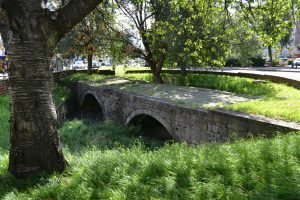 This park is a treasure to visit, the layout of the buildings does nothing to spoil the landscape and its grounds are truly a scenic area and something we all should be proud of in our city. Len Marsh. 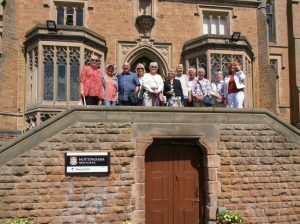 On Wednesday 9th May 2018 the group completed a tour of the Midland Station and some Historical pubs / inns. 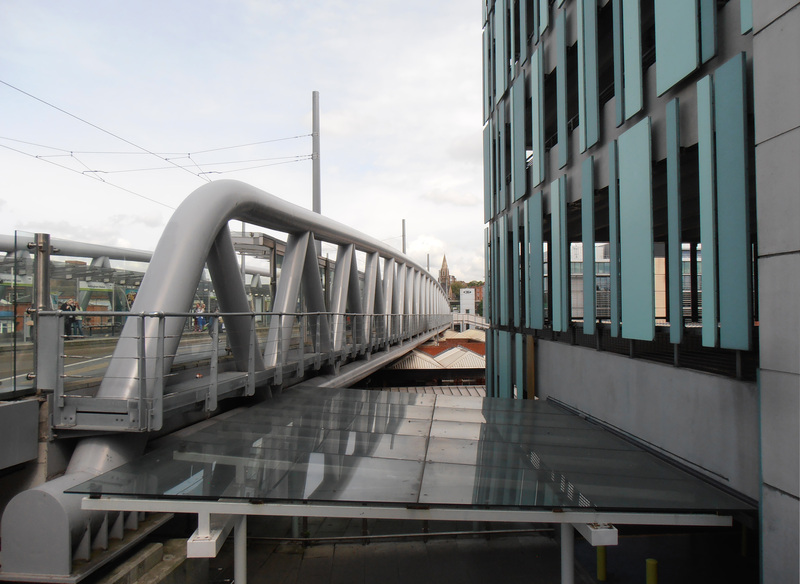 After meeting up in the Council House Arcade sixteen members caught the tram to the Station Stop where we alighted and I found it to be a good focal point to explain the new tram bridge which crosses over the railway station exactly where the Great Central Railway girder bridge did. 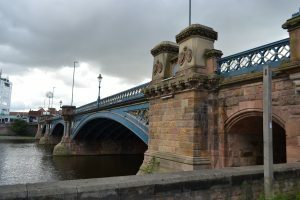 It was demolished in the 1980 s, however the new bridge is a Warrun Truss design made of 20″-28″diameter steel tubes is 48 feet wide and 171 feet long, weighs 1,100 tons and has been named” The Karlsruhe Bridge” after Nottingham’s twinned German city. It is a marvellous piece of engineering and future history. Next we entered Nottingham Midland Station, although we were at the back of the main building I was able to point out the area of the great fire on the 12th January 2018, attended by ten fire engines and costing millions in damage this is still undergoing repairs. The station has served Nottingham for the last 114 years and was opened in 1904 and since the other Victoria Station closed in the 1960s as a result of the Beeching cuts it’s become the city’s main station linked with the tram system. 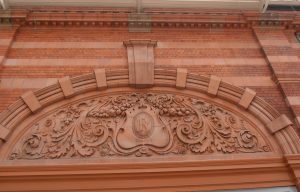 Nottingham’s first station was Carrington Street opened in May 1839 on the site, which is now the magistrates’ court. The original station gateposts are still sited at the court entrance adjoining the main road. 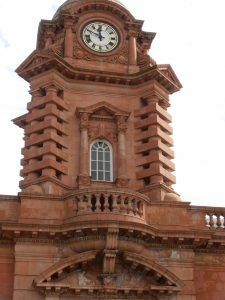 My summing up of this magnificent Midland Station main building -its architectural qualities are outstanding and the masonry is brilliant, we are truly fortunate to have this lovely building welcoming visitors to our city. 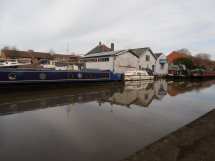 We moved onto the first historical pub, The Canal House, with fine canal architecture and two narrow boats moored inside the building. 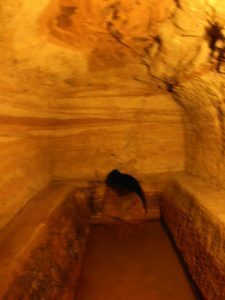 Next we visited the Trip To Jerusalem, set in the sandstone wall with caves linking to our famous castle. Then onto the Salutation Inn where we took a refreshing drink. The landlord took us on a tour of the cellars with an added talk of the inns history. 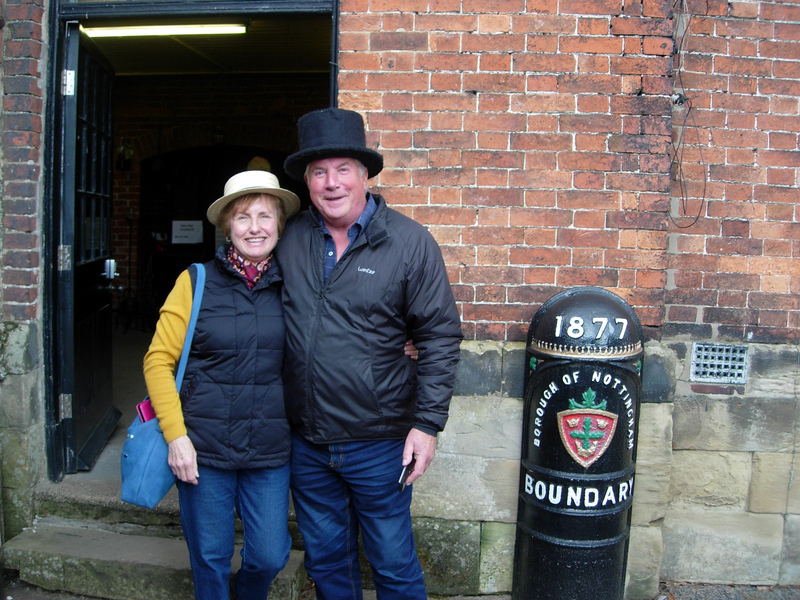 We enjoyed another interesting city tour uncovering some more treasures. Len Marsh. 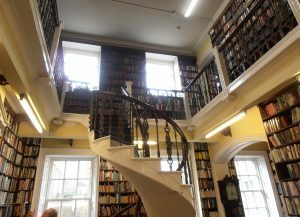 On Friday the 6th April 2018 a group of fifteen members of City Treasures assembled at Bromley House Library on Angel Row, Nottingham for a guided tour .We were met by a member of staff who took us inside and up three flights of stairs to a seated room where the librarian gave us an interesting lecture on the history of the house and library. The grade 2 listed Georgian town house was built in 1752 for George Smith, grandson of a wealthy provincial banker who later had financial problems himself and had to sell the house. 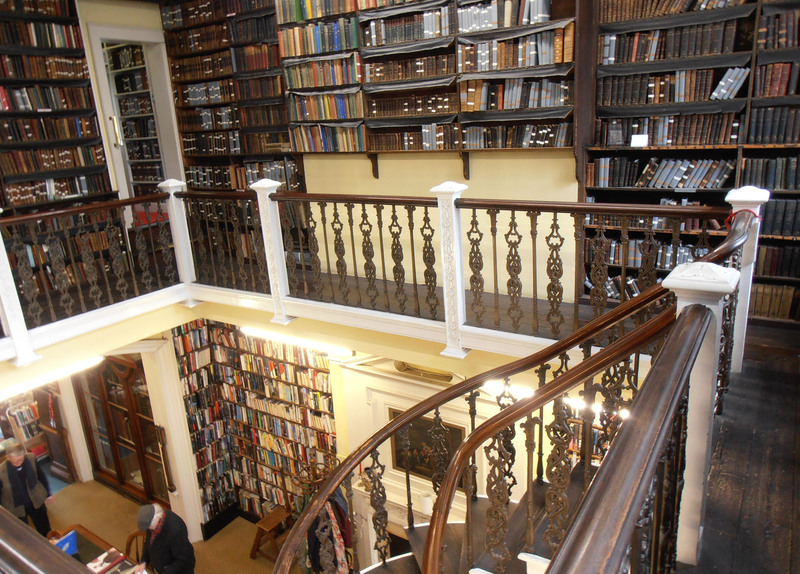 The library founded in 1816 by a group of Nottinghamshire professional men and set up in Carlton Street, later when Bromley House came up for sale, the library purchased it for £2,750-00 and moved there in 1825. 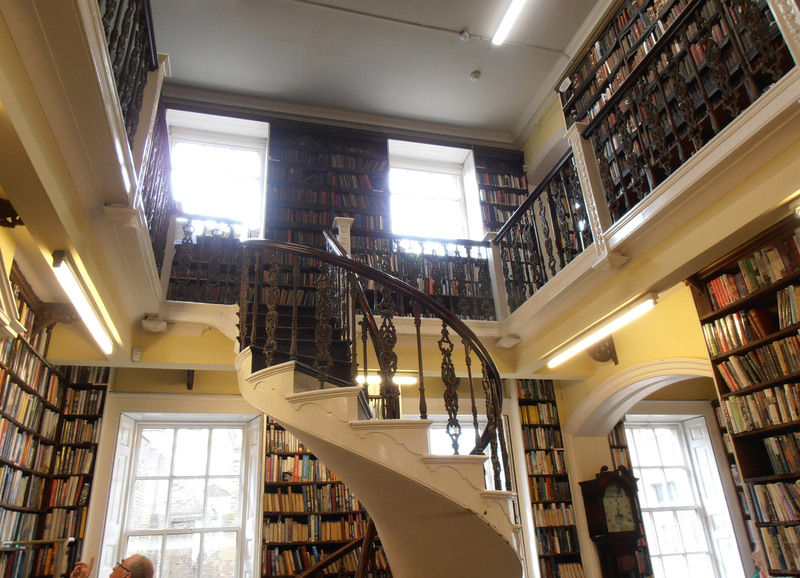 Today it functions on membership subscriptions but as an independent library gets no statutory funding or grants, it has however received help from the Heritage Lottery Fund, charitable trusts and individual donations over the years. 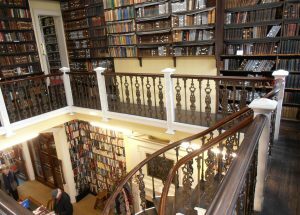 Thankfully the library has an extensive collection built up over its 200 years of history and is one of the few remaining subscription libraries and one of the largest in the U.K. It is also home to one of the few city centre walled gardens. The moment you enter this house it overpowers you with it’s Georgian architecture and style, with individual rooms each one housing a collection of books of different sizes and catalogued. 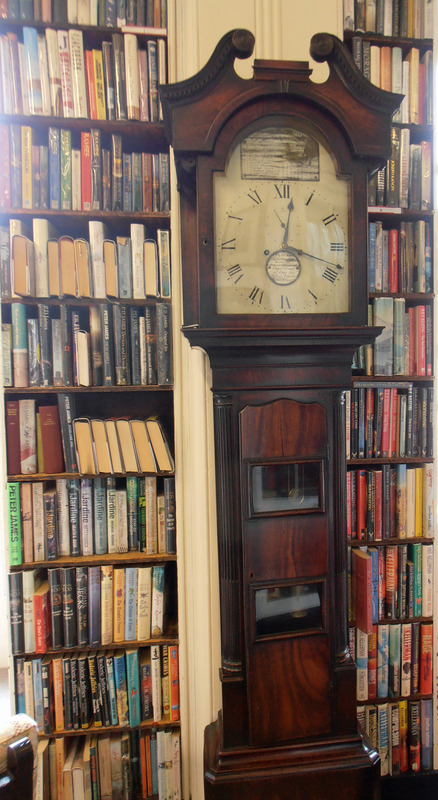 The main room contains a long case clock that is still set to Nottingham time 4 minutes 33 seconds slower than G.M.T. Also from the main room a self-supporting helix staircase links to the gallery. 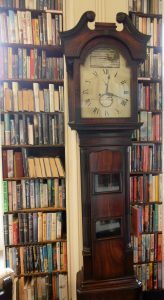 On the first floor (standfast library) is situated the Meridian Line dating from 1836 to set clocks to noon before Railway time or G.M.T. Outside at the rear is a hidden charming garden peaceful to sit in and enjoy a read on a nice day. 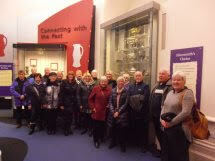 The group enjoyed the tour and lecture; I would recommend it to any group. 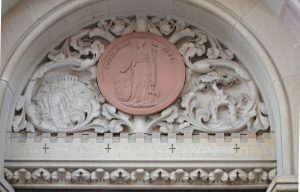 The insignificant entrance door in the heart of the city reveals a true city treasure to all who enter. Len Marsh. 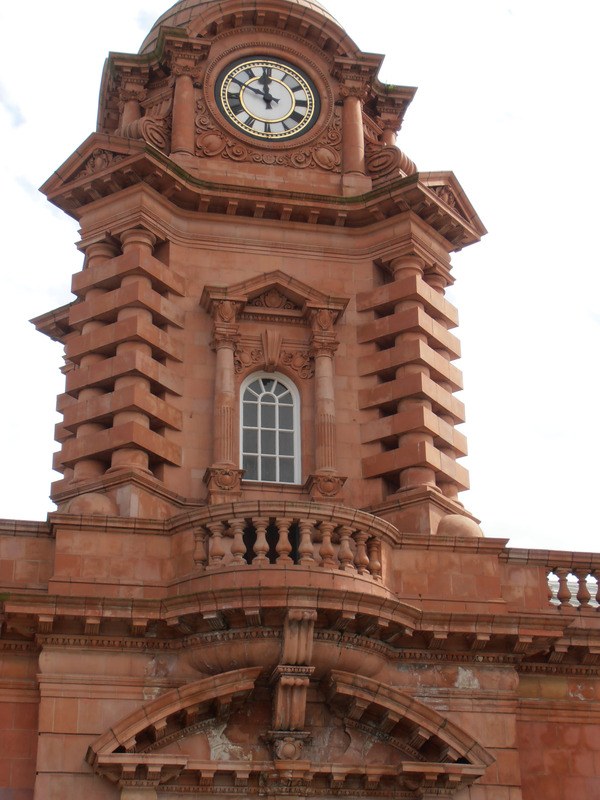 The long case clock that is still set to Nottingham time 4 mins 33 secs slower than G.M.T. 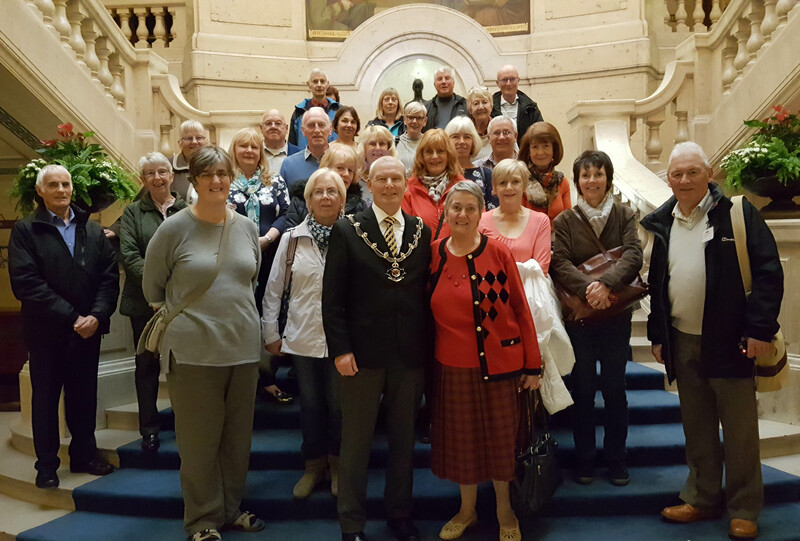 A group of twenty-one members met Tuesday 20th March 2018 in the Nottingham Council House Arcade. From there we walked up to the Lace Market Theatre that is situated, hiding in a cul de sac called Halifax Place Nottingham. 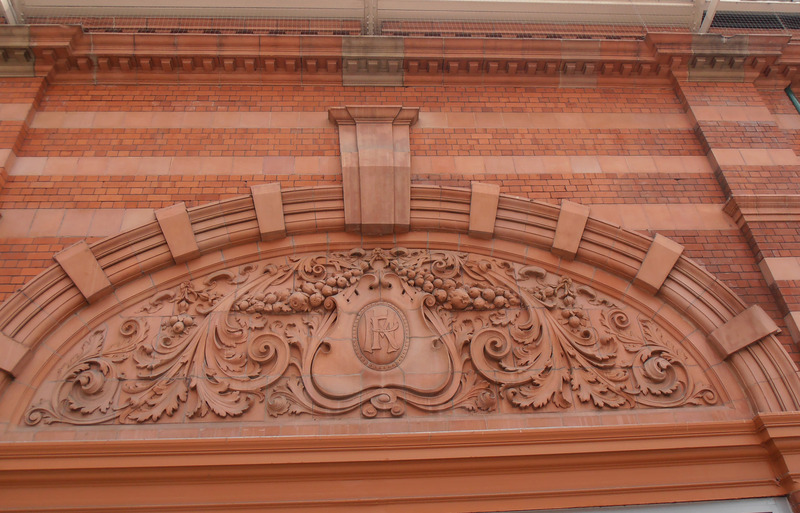 The listed building has a white ornate original Victorian frontage. In the past it has been used for several different purposes, once it was a chapel then a school attended by the famous William Booth founder of the Salvation Army movement. 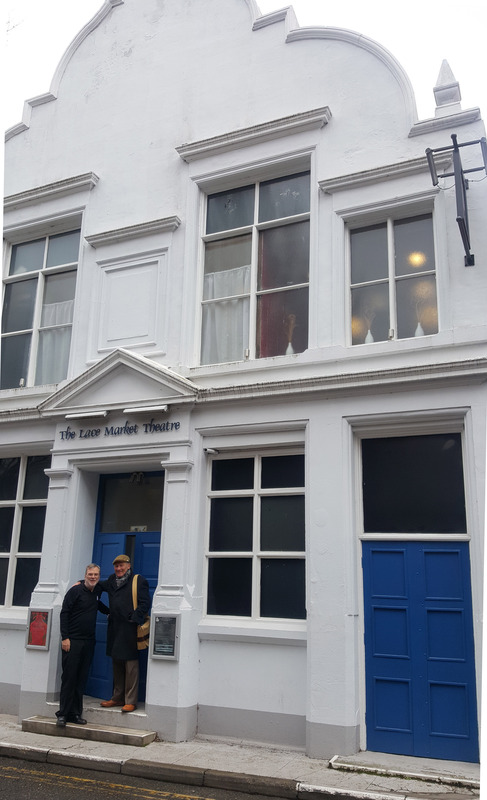 It has also been a warehouse, but luckily for us the present owners John and Beverley Anthony have worked wonders in the last seven years to restore it back to the lovely Victorian theatre it once was. They and their dedicated team of volunteers continue to revamp areas, this year installing a nice licenced bar and coffee bar. Next on the list is the auditorium flooring and seating. The behind the scenes tour is an interesting journey for everyone, it is hard to realise just how much work the team put into a production for a theatre play, also all the skills involved. 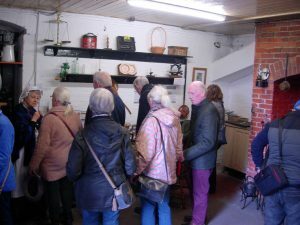 We ended our tour in the cafe / bar for refreshments where John and Beverley answered questions and gave a brief history of the theatre. I hope Eastwood U3A Theatre Group continue to use this classic charming theatre, as it deserves our support. The group enjoyed the tour and we wished them well in the future. Len Marsh. 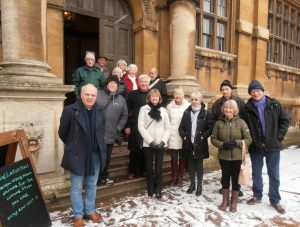 On a snowy Monday morning at 10-30 February 26th, 2018 a group of City Treasures members met in Wollaton Hall car park for a tour of this magnificent Grade 1 listed Elizabethan mansion. 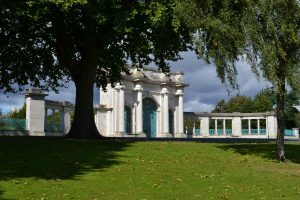 It is situated on a natural hill three miles West of the city centre and surrounded by 500 acres of parkland with formal gardens and avenues of trees and an ornamental lake. Just standing on the steps at the front entrance to the hall you take in a panoramic view of the estate. Often there is a herd of fallow and red deer present in the park. The gentry of the time would have viewed the park from the Prospect Room. 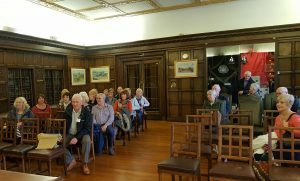 Our guide started the tour in the main hall with a talk about the Willoughby family history then went onto a detailed description of the very decorative room with the gallery and organ also wall displays of rifles and weapons. Next we moved into the basement area with a large steel back door, the servant’s quarters, original bell room and flooring. 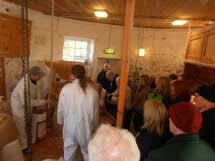 Then we moved onto the restored Tudor kitchen followed by the abattoir where the game etc was cut up. 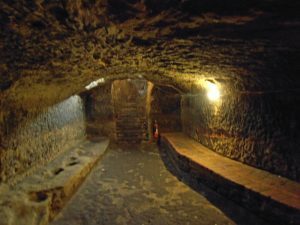 Next onto a grilled gate and down a brick lined tunnel to the wine cellars and the Admirals Bath, a water storage tank carved out of the rock. It was obvious to us the owners were very wealthy at the time of building but history tells a different story, and later after the house fire, it stood empty for forty years. I took the group out of the back door of the hall to enable us to see views and details at the rear of the house often missed by many people. 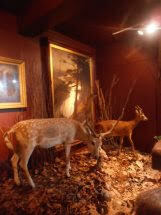 Next I showed the revamped Camellia House and then, after following a narrow period pathway we reached the stable block and went into the nature museum with taxidermy display of wild animals and birds etc. There is also a small museum dedicated to the US Airborne unit who camped in the park before the D-Day landings in the Second World War. The house is now Nottingham Natural History Museum built 1580-1588 for Sir Francis Willloughby and designed by Robert Smythson. He went on to design Hardwick Hall built with Ancaster stone from Lincoln and paid for by coal from local pits. 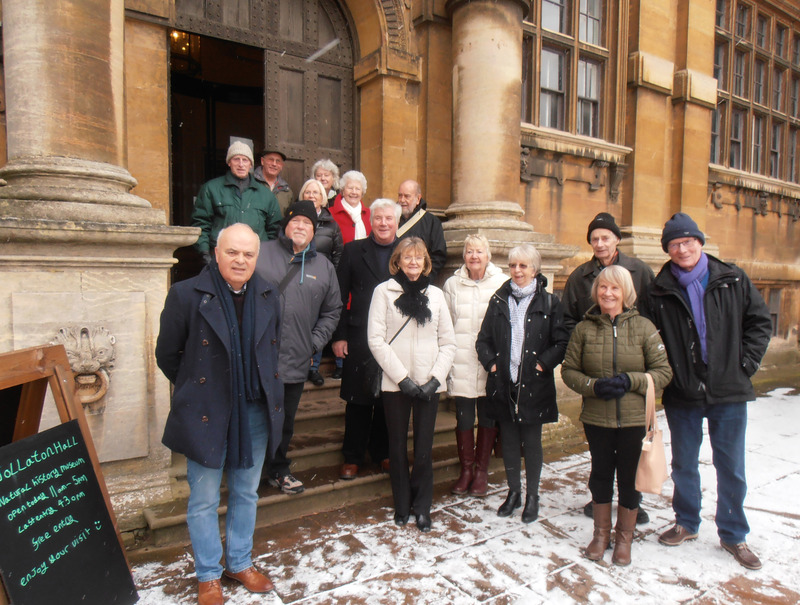 My group enjoyed the tour and I intend another different trip, as there is so much history at Wollaton Hall. Len Marsh. 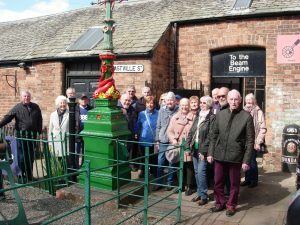 On Monday 15th January 2018 a group of twenty-two members met at The Horse and Groom Moorgreen for a film slide show about Kimberley Past and Present. The old photographs and postcards and the present day photos proved their worth when making comparisons with the old and new situations, and the major changes that have taken place in the Kimberley area in a short space of time. Wolsey’s factory, a school, a row of shops, public houses, railway bridges, Hardy’s house, The Firs, and the Brewery, to name but a few of the things that have changed the local landscape to some degree, and no doubt further changes will happen like the Nottingham City Tram system, which will reach into Kimberley via the old railway route in the not to distant future. 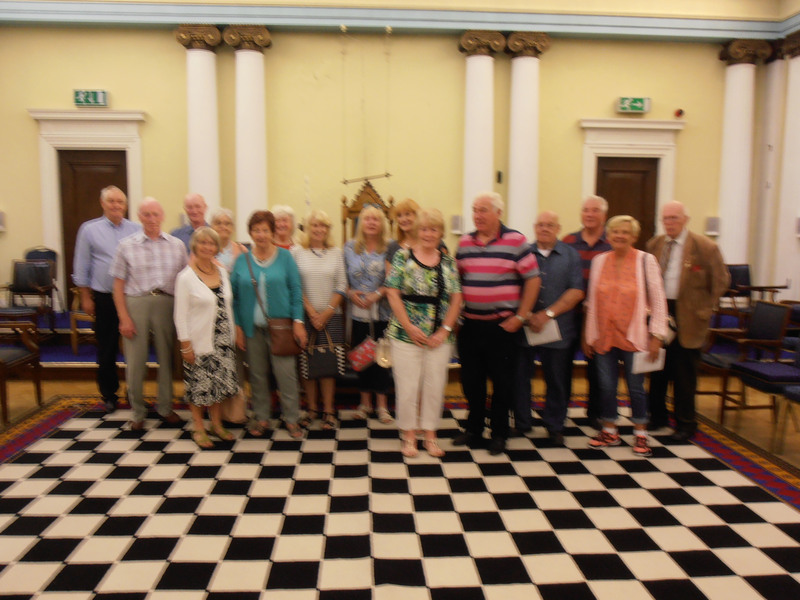 The group found the film show very interesting it also improved our local knowledge for which we had to thank members Bill Saxton, who presented the show and also our thanks to Margaret Naylor for her kind assistance. Len Marsh. 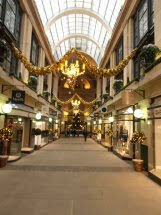 Report from Christmas city tour. 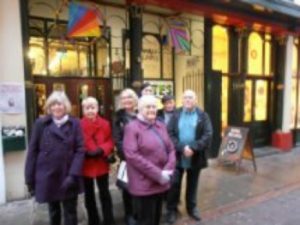 On Wednesday 13th December 2017 a party of members from City Treasures group met up in the Nottingham Council House Arcade for a Christmas city tour. We started with myself pointing out the wonderful display of Christmas decorations as we walked through the arcade, a site not to be missed. 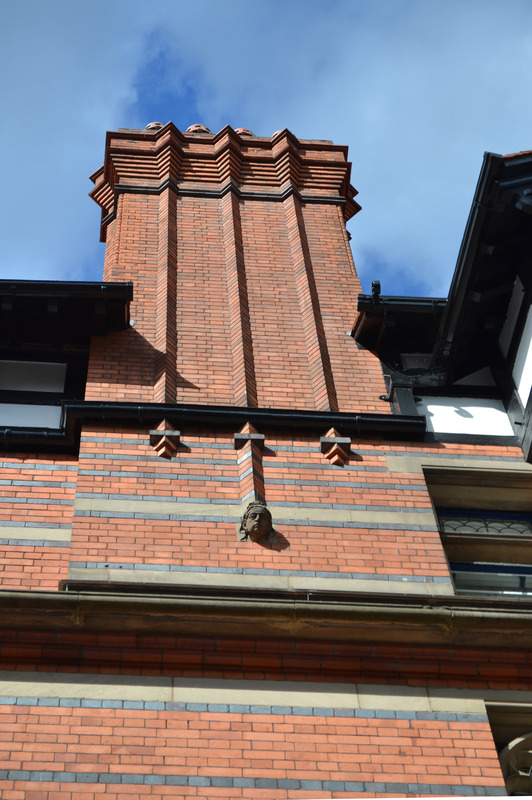 Moving on up Pelham Street and stopping halfway along we admired some beautiful examples of Watson Fothergill architecture. We browsed over the next buildings exterior, The Thurland pub, a lovely example with its original etched windows on the first floor and the frontage is graced with green tiles. This used to be a fine example of a Victorian pub with a Gentleman’s only room sadly this has gone. The owners have restore most of the original decor which we observed inside. 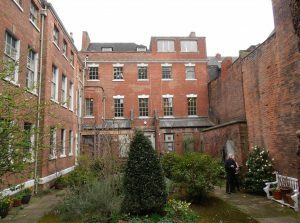 We continued through the Lace Market where we saw work being carried out on one of the oldest buildings in Nottingham then we continued onto St Mary’s church. Inside this historic church I gave a guided tour using a booklet. One of the curators gave us some occasional interaction on factual history. All of the group remarked on how interesting it was, we made a donation and went outside to look further at the exterior. Next we crossed over the road and entered The Galleries Of Justice where I took the group to a brilliant exhibition covering the Pentrich Revolution Marchers. This turned out to be one of the best displays we had seen, everyone was very impressed with it including the continuous film show. On Wednesday 15th November a group of twenty seven members of City Treasures met in the Nottingham Council House arcade for a guided tour of the Council House, going in the main entrance door we were met by our charming guide, Charmaine. 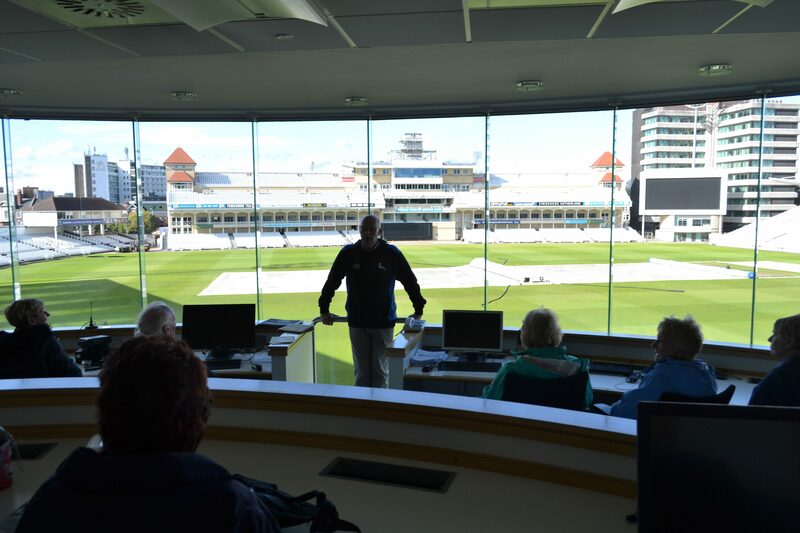 We were taken around the majority of the rooms of interest and given a talk on how the rooms are used. 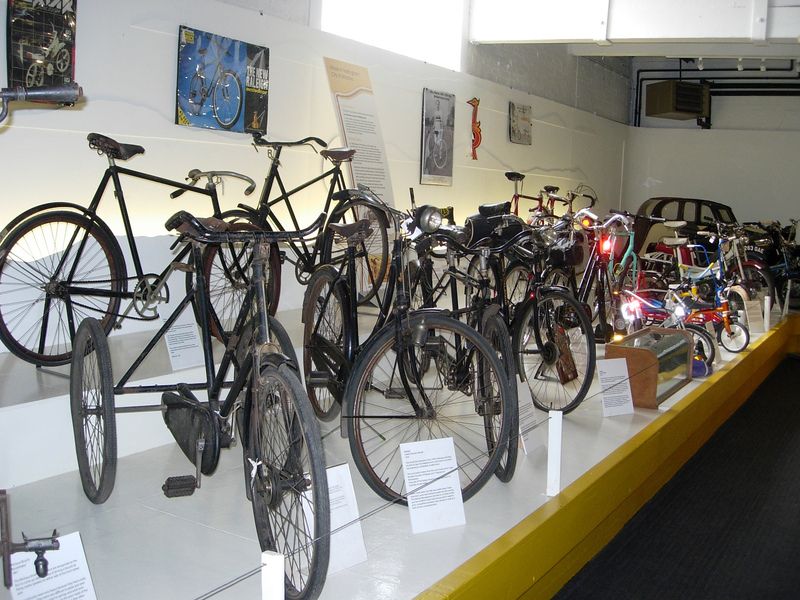 We were also told the history of a collection of artefacts in several display cabinets. 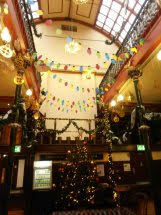 The wonderful ballroom was viewed from the gallery, also the Market Square and Arcade. 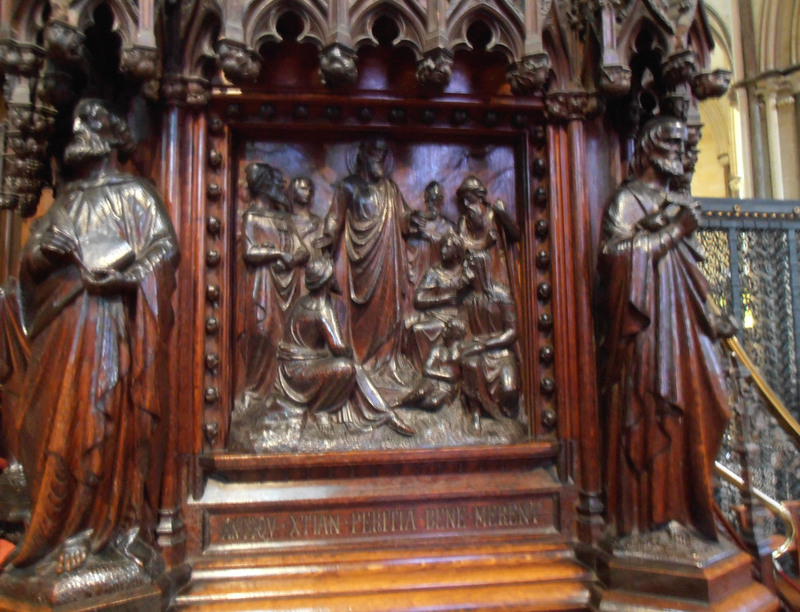 We went into the Council Chamber, a masterpiece in design and carved woodwork with soundproof panels filled with bags of seaweed to ensure quiet in the room, and other equipment to monitor the debates and recorded them. We also met the Sheriff of Nottingham who chatted to members and answered questions they put to him. 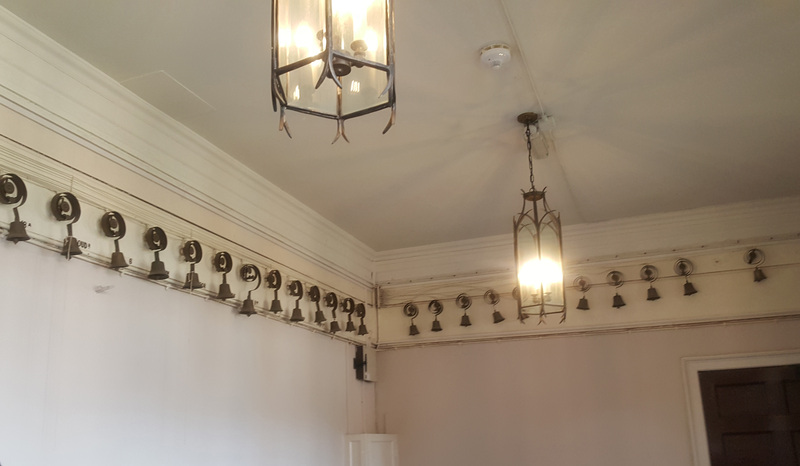 Also in one of the main offices we were shown some thirteen-century books, the original front door knocker and the set of bells used to open Goose Fair every year. In the passageway outside the room was a selection of original furniture from 1929 when the Council House first opened. It was interesting to learn that the Eastcroft Incinerator on London Road supplies the heating for the building. 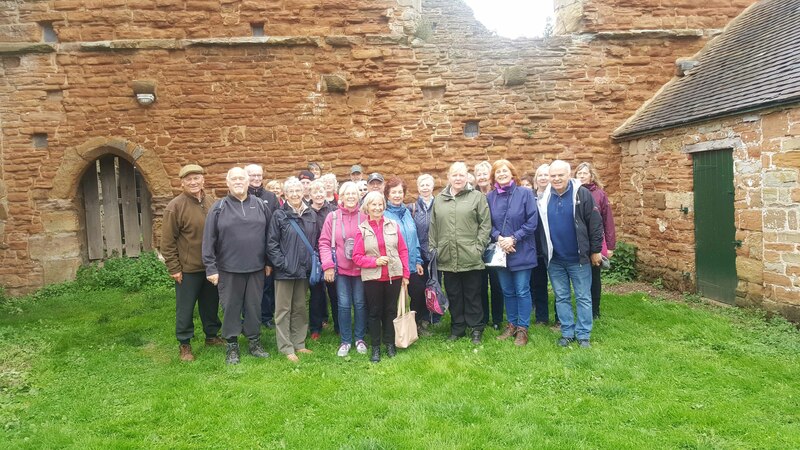 The group enjoyed a guided visit to Beauvale Priory with Ann Whyte. They were given an interesting background of the Whyte family’s involvement and the history of the site. Full report and pictures on the website. On a cloudy overcast Wednesday 11th October 2017 a group of twenty six members of City Treasures met up at the local historic gatehouse venue of Beauvale Priory for a pre-arranged talk and guided tour by Ann Whyte. 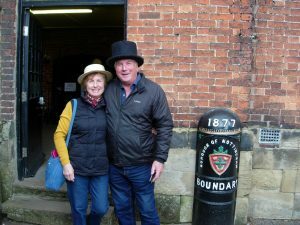 We were given a very interesting background talk of the Whyte family involvement in the present day on going project while sitting in the renovated farm stable containing very old preserved beams and a collection of wall mounted pictures from Durban House Eastwood. We then all took a stroll outside with our guide Ann who spoke about the pond and how the rain water system filled it. 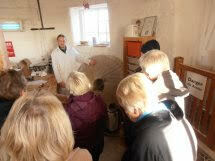 She explained how they converted two cottages into their present day home much admired by our group. 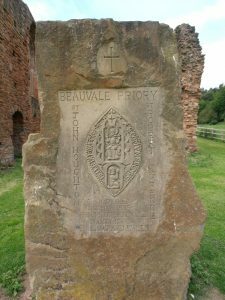 Beauvale Priory was founded in the year 1343 by Nicholas De Cantelupe in honour of the blessed trinity, it was home to a Prior and twelve monks of the Carthusian Order. 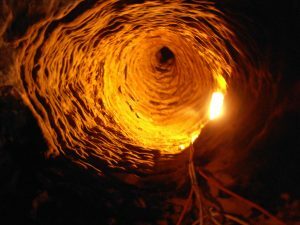 The history and its religious connections are well documented. 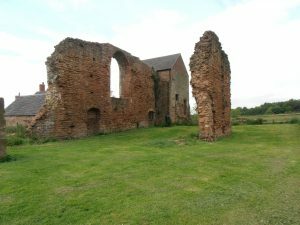 It is one of only nine houses in England and designated as a Scheduled Ancient Monument, the buildings have listed status, the remains of the priory church grade 2 plus the Gatehouse and Boundary Wall are separately listed. 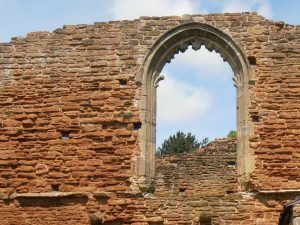 D.H.Lawrence wrote a short historical story “A fragment of stained glass” which connected to the ruins of Beauvale Priory. After a very interesting talk about the lifestyle of the monks we then viewed inside the historic buildings noting how the craftsmen used different timbers and stone to construct the church. After passing through the farm outbuildings we were taken on a lovely walk in the grounds to Tony Whyte’s lakeside bird sanctuary. Here we were told of the local railway that linked to the coal mine close by, both no longer here. This area was so picturesque and peaceful nowadays. On Wednesday 13th September 2017 twenty members of City Treasures Group met up in the city centre for the history walk and talk. We caught a number 6 bus to Trent Bridge and alighted by the once old tannery building now converted into modern flats. We crossed over the road to the gateway of the lovely tree lined embankment it was named in honour of Queen Victoria who died in that year,January 1901. We walked down the right side of the road admiring the views until we arrived at the splendid arch of the remembrance memorial, a talk was given about this structure and its meaning referring to Nottinghamshire people who lost their lives in the two world wars and the Korean war sadly. 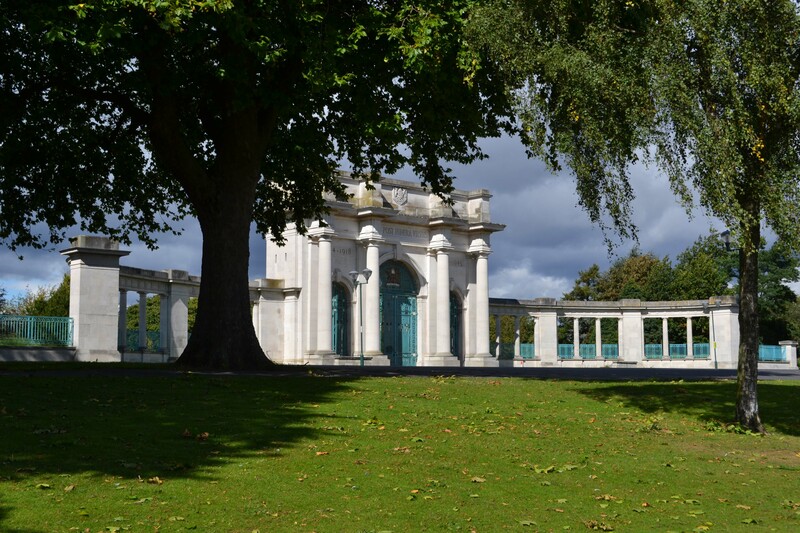 In the adjacent memorial gardens stands the statue of Queen Victoria fronted by water fountains in pools, this is also a nice peaceful area to sit. 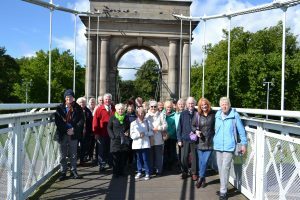 Moving onto the riverside we walked onto the Grade 2 listed suspension bridge owned by Severn Trent Water. Primarily built to carry water pipes from Wilford Hill reservoir to the Meadows housing area, also to be a footbridge, it is now over 100 years old. After a talk and photos of this engineering wonder we walked back to Trent Bridge once again looking at the marvellous construction and observing the flood levels carved in the stone walls. 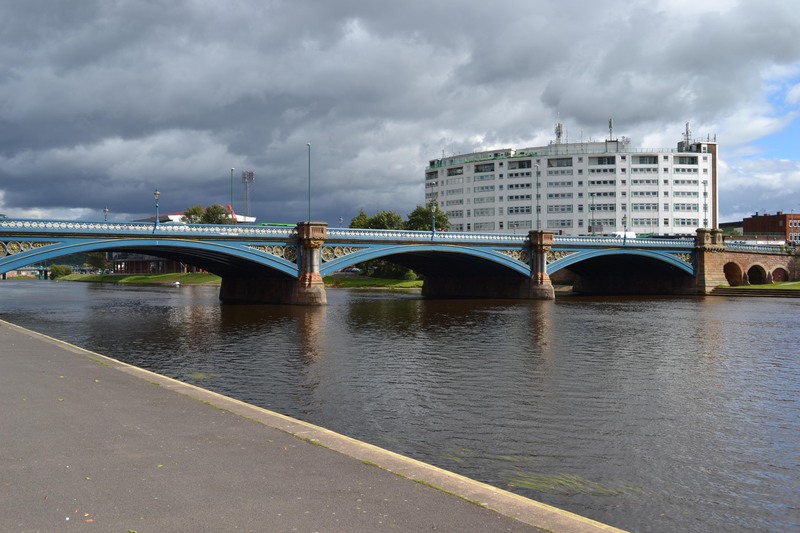 We then went under the bridge archway into a small park area, we looked across the river at the three famous rowing clubs shadowed by the Nottingham Forest Football ground. Moving on we crossed Trent Bridge on the right side giving us splendid riverside views. 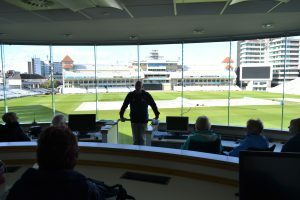 Then stopping at the small road island we talked about the two arches of the old original Trent bridge displayed in front of us, and then had a look at County Hall entrance. It was then time for a lunch break at the TBI also dodging a heavy rain shower. After this we met our tour guide Keith at the N.C.C. 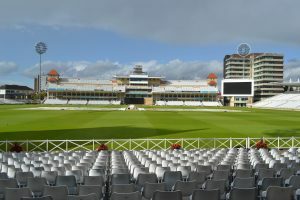 Club ground who took us on a very interesting and factual trip around the ground which is the third largest test cricket ground in the world. 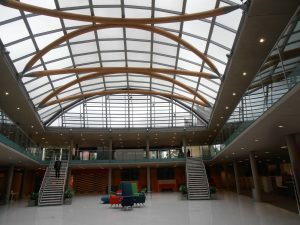 Nottingham’s investments have progressed over the years. Trent Bridge- the embankment- N.C.C.C. has given pleasure to many people with stories and history that abound. Len Marsh. 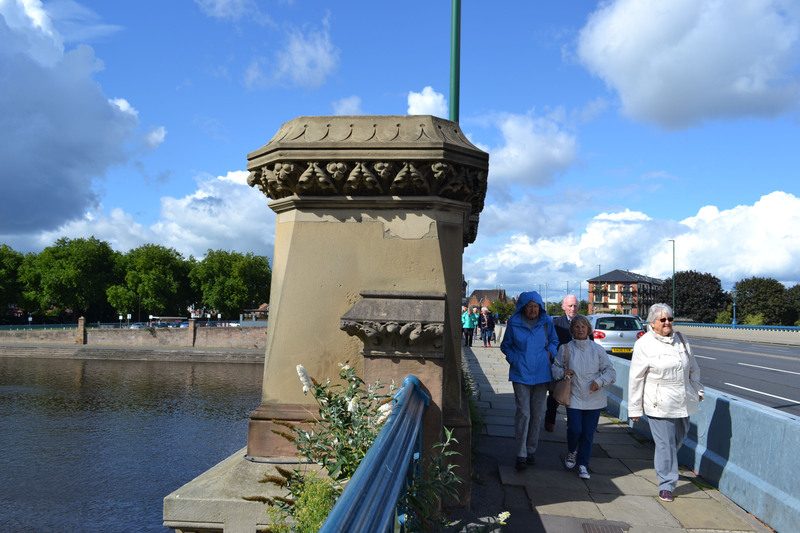 Report from 10th walk – a surprise city tour. On 25th August 2017 sixteen members met in the Nottingham Council House Arcade for a surprise city tour, due to cancelling the one planned because of student re-test exams. 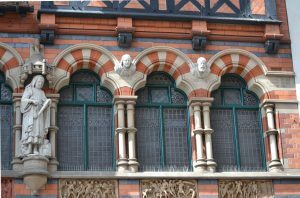 We set off across the Market Square where we looked up and observed some Watson Fothergill buildings with interesting features. We then went up Market Street and onto the old Guildhall building, which is soon to become a hotel. Crossing the road we were now facing two of Nottingham Trent Universities largest and oldest buildings by Newton and Arkwright. Walking down the side of these we then turned left onto Shakespeare Street to view the Arkwright entrance with its wonderful stonework etc. Then we turned left again up steps and onto Goldsmith Street where we stopped adjacent to another majestic building, which is the Masonic Hall a true city treasure that we all admired. We crossed over and entered the splendid building and met our guides for a pre-arranged, interesting talk on the freemasons then an internal tour of the magnificent Masonic Hall. 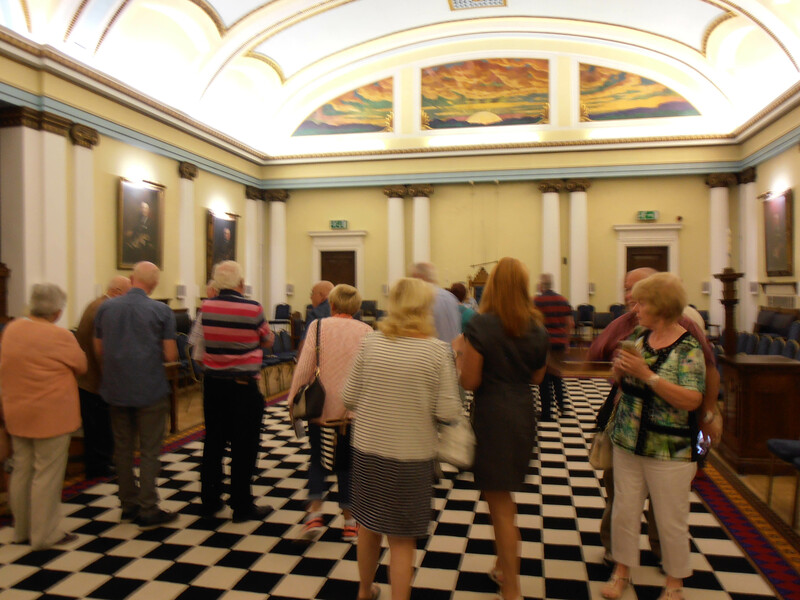 City tour, group in Masonic Hall. 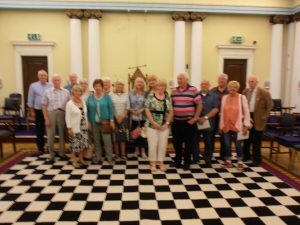 City tour, NTU reception Goldsmith St.
On Tuesday 8th August 2017 eighteen members of the City Treasures Group met up in The Nottingham Council House Arcade and despite the very poor weather conditions outside everyone was quite cheerful and in good spirits. We continued with our trip by catching the tram to the Nottingham University South entrance where we alighted. We made our way to the first Lakeside Arts Centre, and into the Djanogly Gallery, here we viewed three galleries of modern art paintings and sculptures from the 60’s. The displays were illustrated and cleverly made with different materials. 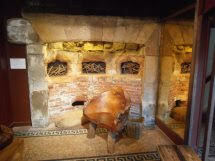 Then into a smaller exhibition relating to dinosaurs and the stone ages in the Anger visitors centre. Moving on we entered the Archaeological Museum where we found wonderful, encased displays of artefacts, all listed with explanatory posters enclosed, which made it all the more interesting to visit. Next we walked to the Recital Hall where we quietly entered and took a seat with the audience and listened to a solo artist play a classical piece of music, a good experience for all. Moving on we crossed to the second Lakeside Arts Centre here we entered an exhibition about India and its culture in the Weston Gallery. Too wet to continue our tour of the campus park we all decided to end the trip and have a lunch break in the Lakeside cafe, everyone enjoyed our day regardless. Len Marsh. 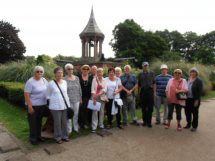 On Wednesday 12th July 2017 twenty members of the group met at the High School tram stop to follow Discovering Nottingham Walk 4, researched by Barbara Wigley. We made a detour at the start to visit The Nottingham Deaf Centre building on Forest Road West, a fine piece of architecture. Back on track we entered the gate to the granite monument for the fallen in the Boer War. We continued along Forest Road East noting interesting places, Ristes Motor Co and Nottingham High School where we had a pre arranged external tour of the grounds etc. This was different and enjoyed by all. On to North Sherwood Street to the Jewish Cemetery. We were unable to enter due to closure but details of this gem were read out to the group. 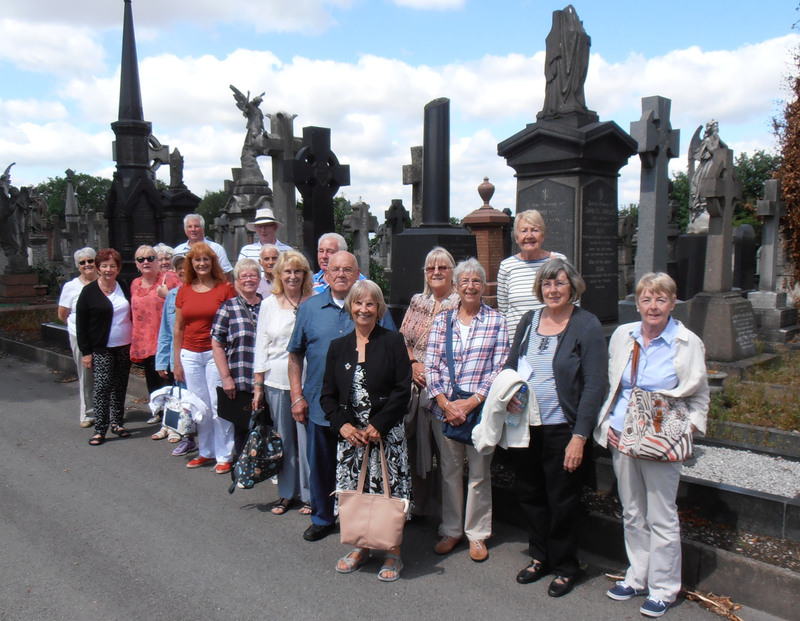 We then crossed the road to the Rock Cemetery where a talk was given regarding the area and past historical events. We then had a steady stroll around the pathways taking in points of interest such as, the landscape/ caves, tunnels and stone work. This is a Grade II listed cemetery and because of its layout in the old stand stone quarry it made an interesting tour. The group enjoyed the scenery plus the marvellous monuments of angels etc on display. We entered the Forest off Mansfield Road and I gave a talk relating to Forest Lodge, and the enclosure oak, then the Victorian race course followed by Nottingham Forest. the first public park in Nottingham containing over one thousand specimen trees and shrubs. 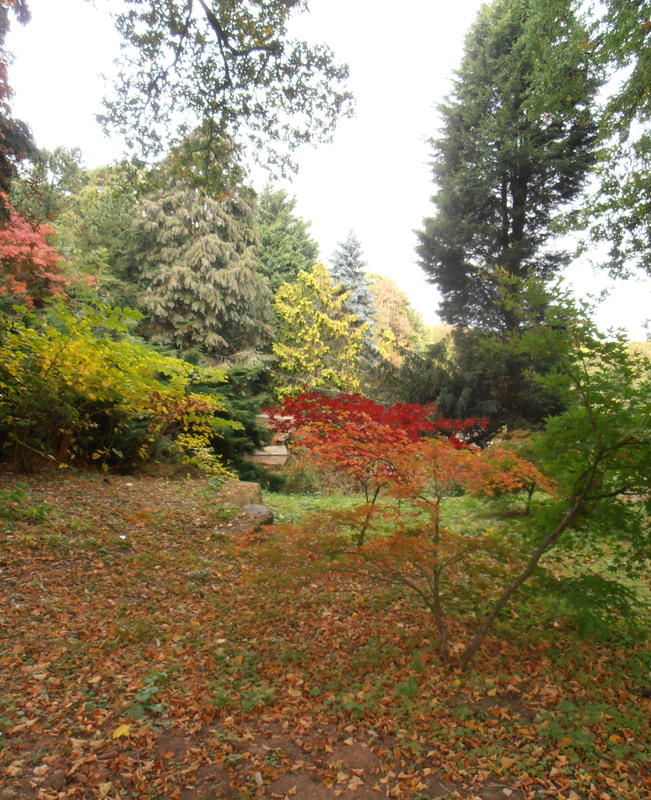 There are some really beautiful trees to admire in the grounds. However there was a lack of colour from flowers and signs of poor garden maintenance, probably due to council cuts. Despite this we found numerous items of great interest, like the Chinese Bell Tower, canons and the Victorian Circular aviary. On to the statue of Samuel Morley, a famous hosiery manufacturer and great benefactor to Nottingham. We noted that Waverley Lodge gatehouse has recently been renovated and looks impressive but was closed. Crossing Waverley Street we then looked at the superb architecture of the Waverley Building which now houses the Nottingham School of Art. 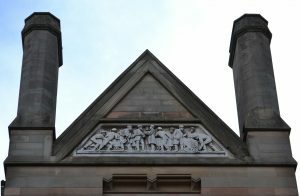 Moving on to the Terrace Royal, everyone was amazed at the stone masonry and individual carvings on the eight terrace houses now occupied by university admin offices. Benjamin Mayo and the story of The Old General. This site is sadly overgrown with weeds and ivy, spoiling what was once a proud burial ground with marvelous stone memorials to people. A talk was given on the Alms Houses and Canning Circus area and we then proceeded down Derby Road and into the Park Tunnel area. This really amazed most of the group who found it hard to believe it existed. 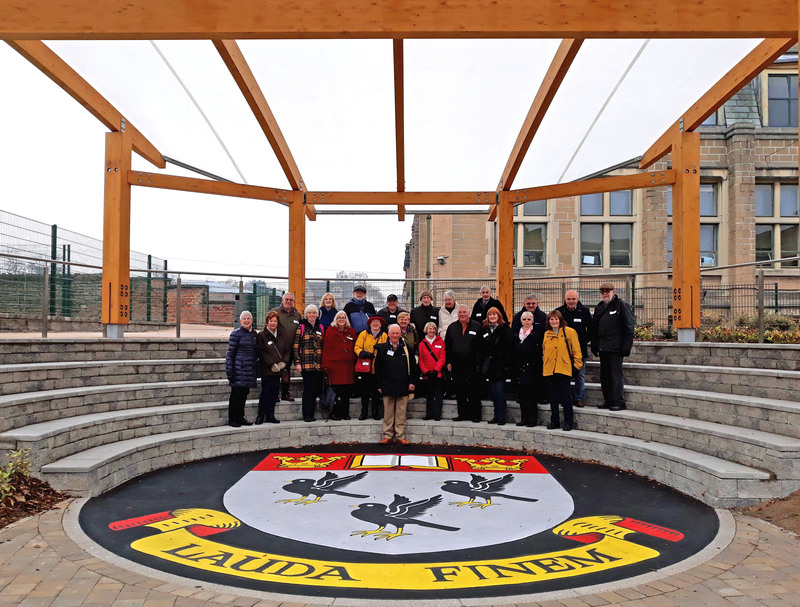 There, photos were taken and the group expressed their thanks for another interesting tour. Our thanks to member Barbara Wigley for loan of the Walk 1 guide book, information and picture cards. 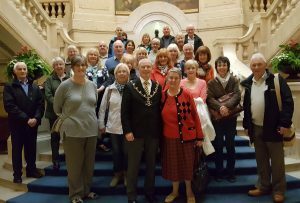 Twenty four members of the group met in the Nottingham Council House Arcade on Wednesday 10th May 2017. From there we walked up to Hockley and into the quarter mile square of Nottingham Lace Market. Once regarded as the centre of the world’s lace industry during the British Empire, today it is a national heritage area displaying many fine Victorian four to seven storey red brick building lined streets. With iron railings, old gas lamps and red phone boxes it was an area of salesrooms and warehouses storing, displaying and selling lace. After a talk in the college square we moved onto Stoney Street to find a large board showing a map of the area, plus another with local famous people illustrated; also large portraits depicting them on the wall of a tall building. Moving on we faced the famous Adams building now part of the City campus of New College Nottingham, then on our left we passed the new art college. Next came the magnificent Broadway Buildings dating from the 1850s. 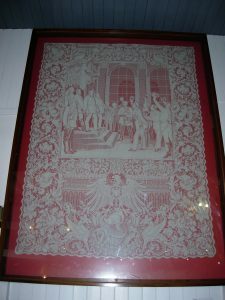 Some are still used in textiles today. The architecture in this area speaks for itself. Onto High Pavement and a lovely side view of St Mary’s church the stained glass windows and the excellent example of early English Perpendicular architecture. We then went into the newly refurbished Justice Museum, firstly to watch an introductory film show, then into two free exhibitions where some members stood in the old Bow Street Dock facing a board which displayed photos of famous villains. Moving onto St Mary’s Gate we saw examples of old and modern styles of sash windows before finally arriving at Debbie Bryans Shop. 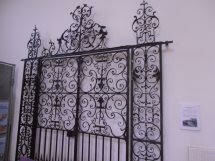 We entered and were allowed to browse the interesting artefacts/antiques and lace etc. Here we had a cream tea/homemade scone served on lovely old china, adding to the character of the shop. Debbie then gave us a very interesting talk about the shop, her career and the lace industry; also her royal link in the making of shawls for William and Kate’s children. We observed how very intricate and skillful lace making is, also how very expensive it is today. 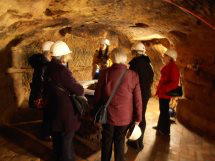 Overall we had a very knowledgeable day covering more of Nottingham’s history and it was enjoyed by all. On Wednesday April 12th 2017, 23 group members met up in Nottingham Arcade for Walk 2 – Mansfield Road. 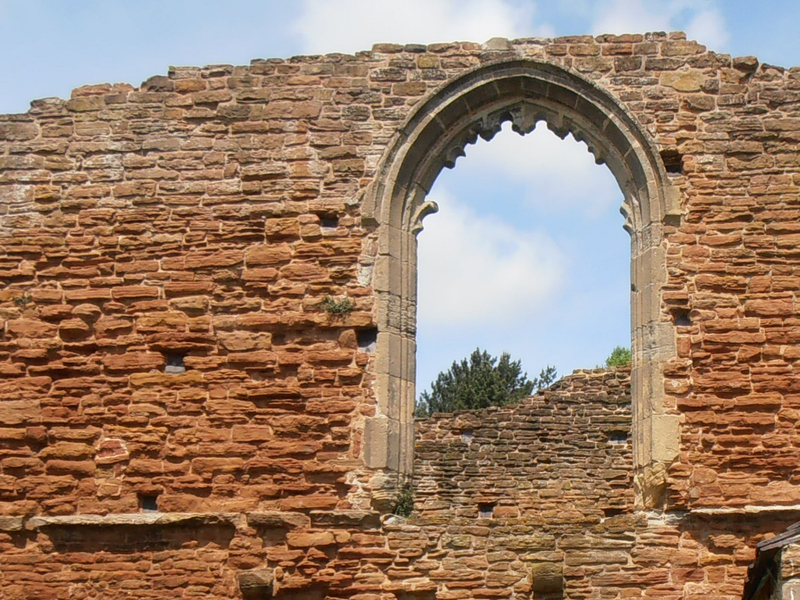 This was researched and compiled by Discovering Nottingham group member John Beech. We followed his tour from the Victoria Centre up to the top of Mansfield Road, where it converges with Forest Road, then back down the other side to Milton Street, ending at the Old Trinity Square. Here Group member Harry Emsley provided us with a talk on the old T.Bailey Forman building and notes on the Evening Post newspaper. 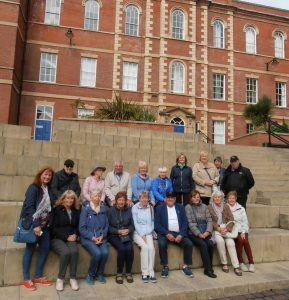 We arranged a visit to the old Bluecoat School where we saw the main hall and the maze of corridors and rooms; also the new internal school museum being created with very interesting artefacts. We then went into the back garden for a close up view of the two statues of pupils and the clock tower with engraved foundation stone. Overall there were plenty of things to point out and talk about, also very good information and old photographs in John’s book. The group really enjoyed the tour. 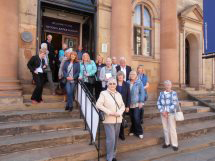 On the 8th March a group of fifteen U3A members met in the city arcade and were taken on a walk through the city streets, highlighting magnificent old buildings like the Methodist church on Castle Gate. Then we went down Maid Marian Way to Wilford Street where we joined the Nottingham Canal and turned right to run parallel with Castle Boulevard. 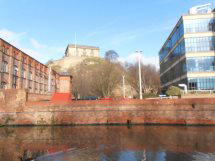 This gave us different views of the city, castle and close ups of the Inland Revenue buildings. 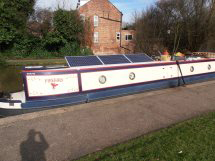 There were other aspects to see like people’s narrow boat homes, some with modern sat- navs and solar heating panels with other interesting bric-a-brac items on the roofs. Continuing on the towpath we came to an interesting family boat builder’s yard. Finally, crossing a bridge over the canal, we came to the Dunkirk area, which was once the scene of many motorcar scrap yards but now reduced to one as an industrial estate has taken over. Next we went under a very low railway bridge and down some narrow streets onto a footpath, which was by a stream, and led us onto University Boulevard. Here we were looking at the old Highfields Lido area now covered by a lovely cafe/art gallery/lecture hall/and museum. Moving on we walked to the main lakeside theatre block, another interesting place with art gallery /lecture hall/weather museum /and a nice cafe with a picture view of the original university Portland building, lake and landscape to peruse over. misty weather conditions. However, we continued around the east end of the castle before entering the museum. 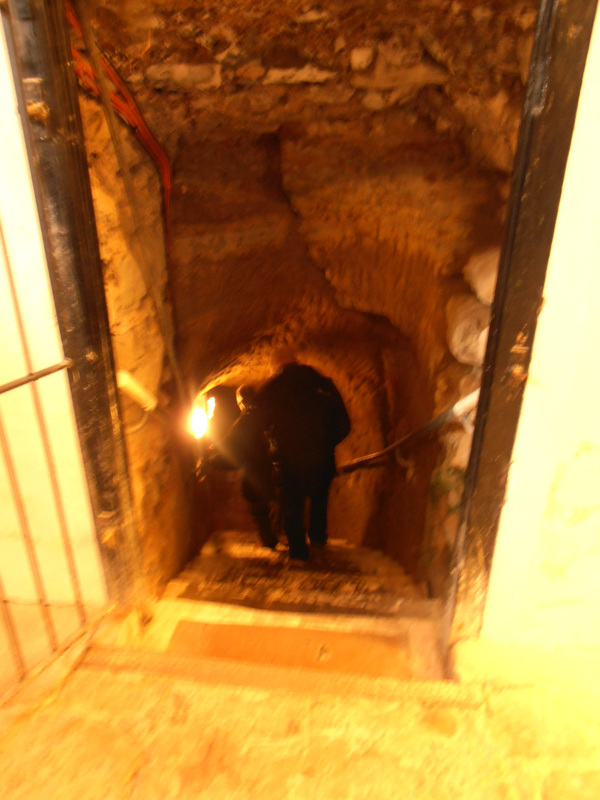 The group followed a pre-planned route inside and most people were amazed when they saw the displays of artifacts etc. The military museum was impressive, covering WW1 and wars up to the Afganistan conflict. 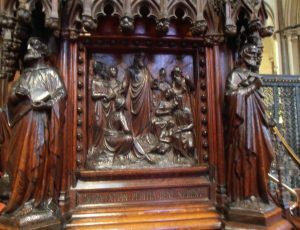 We moved on to the Old Nottingham exhibition, with brilliant displays; then up the stairs past a lovely oil painting of the famous major oak tree and into the art gallery which everyone found very impressive; then the silverware and pottery displays. We all had a break for lunch in the cafe, a group photo, then a wander back to our own points of interest. 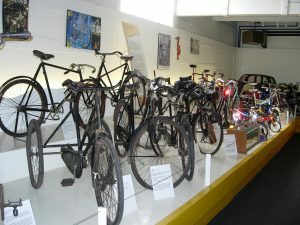 There is a lot to see at this museum and we all found it very interesting and enjoyed the tour. A few members of the group met in the Nottingham City Council House arcade with it’s interesting architecture and displays of lovely Christmas decorations. Afterwards a tour guide took us on a grand tour of the council chambers. 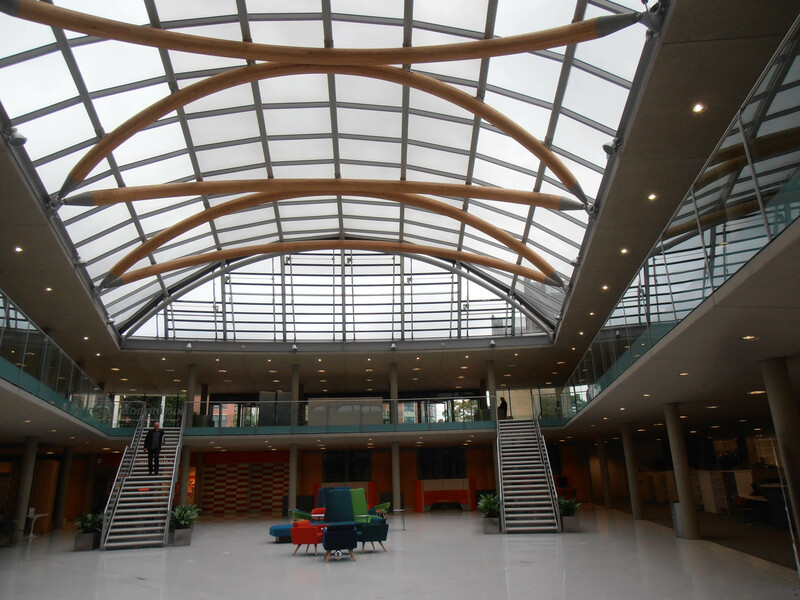 This Nottingham building has a brilliant internal construction. In my opinion the external views don’t do it justice and I would recommend more members to go and see it. After we went onto St James Street and walked up to The Malt Cross, where we took a break for coffee and cakes. Rebekah Wood the tour guide gave us an in depth talk, including singing folk songs in the theatre. We went down two levels to the caves where another talk took place. Back on St James Street Rebekah explained the historical facts of the Malt Cross building. Everyone enjoyed the tours and I will be visiting these venues again in the New Year for the members who missed it. After meeting at the Lace Market tram stop the group were taken on a tour through Hockley then down into Sneinton market place. From the onset I made it a walk and talk pointing out places of interest etc. We continued up Sneinton Road to the Windmill. 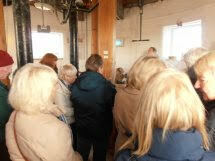 A talk on the history of Greens Mill was followed by an internal climb of four floors to the top of the mill. Here the mechanical gears and working parts were visible and an informative, interesting talk was given on every floor on our descent. On the ground floor both millers were showing us the flour they were producing and explaining how important the sale of their flour is. 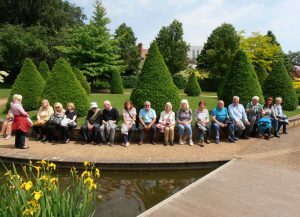 Everyone enjoyed the mill, we celebrated with a break for tea and a look in the science museum and outside flower garden. belonging to the family. 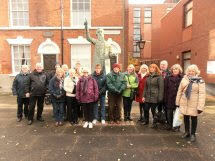 Outside in the courtyard a group photograph was taken in front of a splendid statue of William Booth.